Wallwasher Surface LED Profile Housing . Surface Led wallwasher profile. Surface wallwasher Led Profile Housing. Wallwasher Led Profile Housing. Material aluminium with Milky acrylic. 70mm x 28mm . Available in 2Metres size. 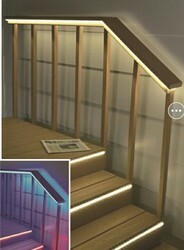 Also available on complete Led option. Profile housing Weight 1.3Kg Per Metre. Light transmittery - > 77%. Max Strip Width - 12Mm. Aluminum LED profile include the opal matte PC diffuser, 1m/pcs with end caps & steel wire. Installation: Suspended Used as Pendant or hanging Lights. Our reputed entity is engaged in supplying LED Aluminium Profile . - 3rd slot size- customized according to a Customer’s need. Application: Auditorium Hall,Seminar Hall,Drama Hall.